I am seriously in love with this series. If you’re looking for the hottest MMA fighters, look no further. Each one of JB Salsbury’s novels will have you sighing, laughing and swooning. Although this is book 3 in the series, each one can be read as a stand-alone. Working in a Las Vegas bar isn’t Georgia McIntyre’s dream. But she hopes it’ll be an end to the nightmare. She’s watched him, followed him and kept tabs, all in preparation for this moment: to make amends and share the secret she’s been carrying since she was a kid. But she didn’t count on the feelings that seeing him again would stir up, the vacant look in his stormy-blue eyes, and his perfect body now mutilated by ink and metal. And she knows why. She’s lived his pain every single day, since the day he left. Changed by time, Rex doesn’t remember the girl from his past. If only she could do the same. Will she get the absolution she’s spent her life seeking? 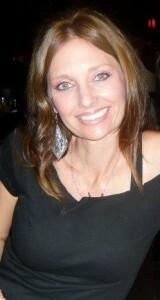 That’s my earliest vivid memory: waking up in a hospital bed. It’s funny. I don’t remember wanting to die. I don’t even remember why I did it other than the satisfaction of marking my skin and watching my blood pool. The visions I have of that day only come in flashes and specific colors: bright red blood against my pale skin. Surprisingly, the thoughts don’t evoke much feeling. But then there are the others, two very specific flashes: fire-orange hair and light gray eyes. And with those visions comes the warmth, the peace. There are sounds that accompany the soft orange waves and the misty gray eyes—humming—soothing, rhythmic melodies that calm my inner turmoil. You can pre-order Book 3, FIGHTING TO FORGET, starting on April 1. The release date is April 15. SYNOPSIS: Every fighter is drawn to the violence, the release that a perfect hit can bring. jolt him back from the numbness. The fiery pain is all he can feel, and nothing compares to the burn. Working in a Las Vegas bar isn’t Georgia Maxwell’s dream. But she hopes it’ll be an end to the nightmare. Over a decade she’s watched him. Followed his career and kept tabs, all in preparation for this moment. To make amends, repair the wrong. But she didn’t count on the feelings that seeing him again would stir up. The vacant look in his stormy-blue eyes, his perfect body now mutilated by ink and metal. And only she knows why. She’s lived his pain, every single day, since the day he left. she could do the same. Or will he continue, Fighting to Forget? 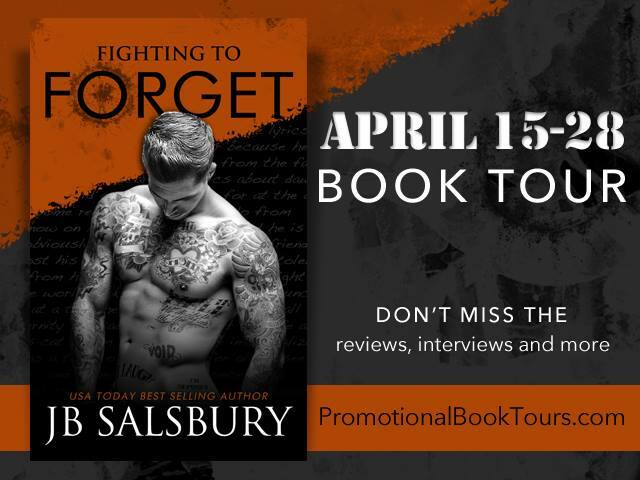 AUTHOR BIO: JB Salsbury, bestselling author of the Fighting series, lives in Phoenix, Arizona with her husband and two kids. She spends the majority of her day as a domestic engineer. But while she works through her daily chores, a world of battling alphas, budding romance, and impossible obstacles claws away at her subconscious, begging to be released to the page. 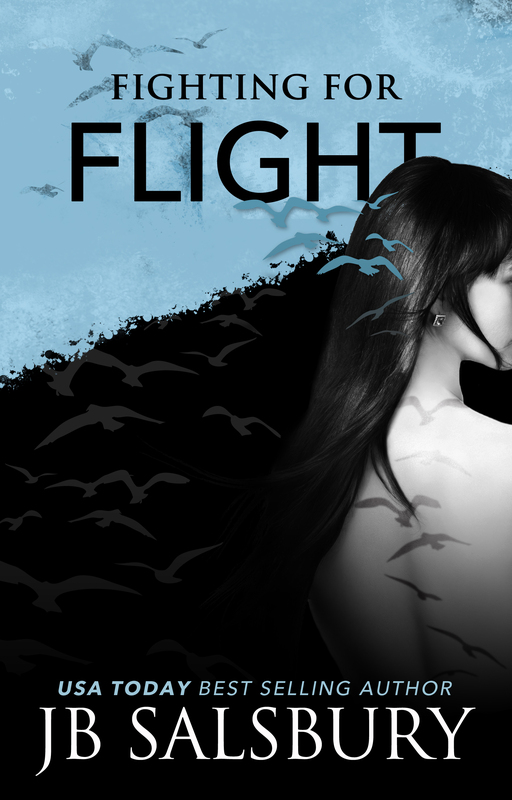 Fighting for Flight and Fighting to Forgive are the first two novels in the MMA romance series. Fighting to Forget is due to be released in April 2014. For more information on the series, upcoming signings and events, or just to say hello, visit JB on her website, Facebook, or Goodreads page.